Motor Home Specialist is the #1 Volume Selling Motor Home Dealership in the World. Over $165 Million Dollars to Choose From. New RVs from $17,999 Travel Trailers to Over $2,000,000 Bus Conversions and Every Type & Price-Point in-between. No Games. No Gimmicks. Upfront Pricing on Every Make and Every Model. Minimum 25% Off M.S.R.P. on All New Motor Homes. 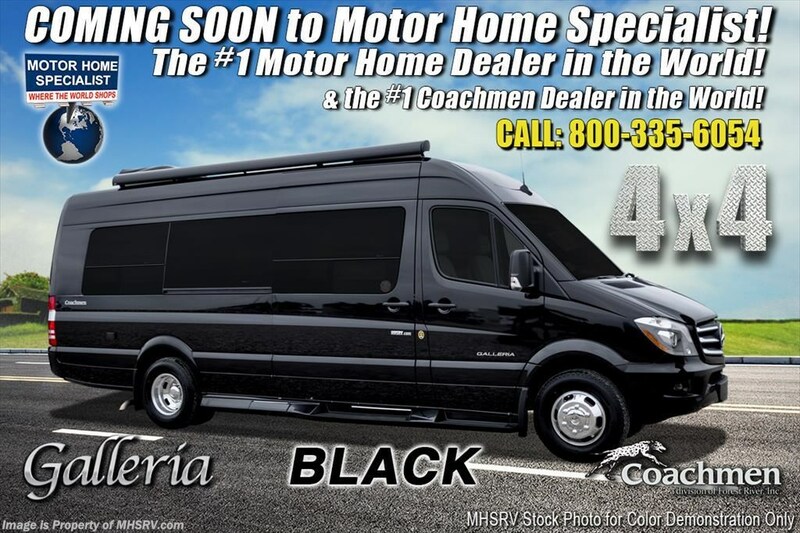 Visit MHSRV.com or Call 800-335-6054.<br />12-10-18 <a href="http://www.mhsrv.com/class-b-rvs/"><img src="http://www.mhsrv.com/images/sold_class_b.jpg" width="383" height="141" border="0"></a> MSRP $206,322. 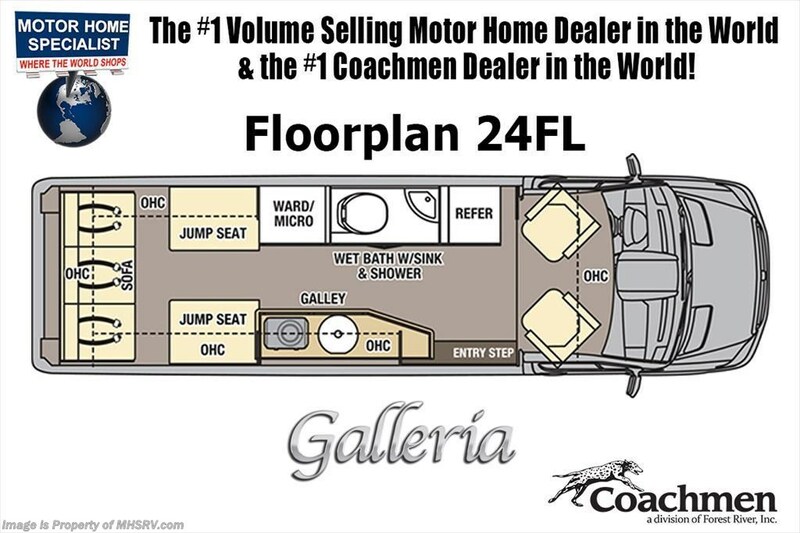 New 2019 Coachmen Galleria Model 24FL. This luxury Class B RV measures approximately 24 feet 3 inches in length. The Galleria RV features a power armless awning with wind sensing & LED lighting, rear screen/shade, Truma Combi Furnace/Water heater, macerator, convection microwave, Fantastic Fan with rain sensor, induction cooktop, low profile A/C, solid surface counter top, LED TV, back up camera, LED lighting, solar panel, USB ports and ground effect lighting. Options include the Li3 Lithium Battery System with 600amp Lithionics Lithium battery with 3000W inverter, 4x4 Chassis upgrade, upgraded front window covers, 4 point hydraulic leveling system, V.B. air suspension, polar package plus tank heating system, wifi, sofa rear seating, dual captains seat, the electronics package, side entry screen door, aluminum wheels, solar upgrade and the Travel Easy Roadside Assistance. For more complete details on this unit including brochures, window sticker, videos, photos, reviews & testimonials as well as additional information about Motor Home Specialist and our manufacturers please visit us at MHSRV .com or call 800-335-6054. At Motor Home Specialist we DO NOT charge any prep or orientation fees like you will find at other dealerships. All sale prices include a 200 point inspection, interior & exterior wash, detail service and the only dealer performed and fully automated high pressure rain booth test in the industry. You will also receive a thorough coach orientation with an MHSRV technician, an RV Starter&apos;s kit, a night stay in our delivery park featuring landscaped and covered pads with full hook-ups and much more! Read Thousands of Testimonials at MHSRV.com and See What They Had to Say About Their Experience at Motor Home Specialist. WHY PAY MORE?... WHY SETTLE FOR LESS?